Good morning to all My Creatve Time friends! I hope you are having a wonderful week so far..I am so happy to share this stamp set today because the font is so gorgeous! Its called Floral Sentiments and.....Emma came out with a flower die!! I am so excited about this die! I have been using in my last few projects in case you missed it. I love this die! It's so easy to use. For my project I made this mixed media canvas you can find at your local craft store. I sprayed it with glimmer mist and added Snow Tex for dimension. (using the Snow Tex was not my original idea)What do you think? I didn't make a video on this one but I can if requested. 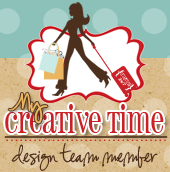 Thank you for stopping by today an do not forget to visit the talented DT members for more great ideas. Big crafty hugs to you all! Wow wow wow!! What a beautiful picture!!!! Love all the fab details! Thanks for sharing another awesome day of sneaks!! Very nice art work!! Love the earth tones!! Wow your canvas is fabulous!! Love everything about it!! These rolled flowers are just awesome, so happy to see them come into Miss Emma's line of products!! Love the sentiment as well, love the font! Wow such a beautiful canvas. I love the colors and the flower is a great addition to you picture. Great ideal to spray it with glimmer mist and adding Snow Tex for dimension. I really like it. I would love to see a video. TFS AJ! A work of art! Beautiful!!! Love your canvas!!!! Its really beautiful and I love your flower! Thanks for all wonderful projects this week!!! They've been amazing! Hello! Love the texture on your frame. Thanks for sharing. Nancy ~ Oh my this is just GORGEOUS! The textures you used for this project is beyond incredible! I LOVE ALL the details! Always so inspiring to see your creations! ABSOLUTELY a video need to be made on how you created this masterpiece! I would LOVE to see how you did this! very nice project!! Love the flower and all the embellishments. I love this! Cute couple btw!! This is soooo super cute! Love that little frame behind the sentiment at the bottom too. Everything about it is perfect! Great job! So many great elements! Super job! Fabulous!! I like the Snow Tex for dimension. Lovely canvas art!! The flower die is a perfect accent. Great use of canvas. You're so outside the box. Love it!! TFS. The more DT member's post I look at the more I am lovin' this stamp set. Thanks for sharing. Love how you used the canvas. What a beautiful layout, very sweet!!! Very unique! I can't wait for tomorrow. Beautiful. Your home must look so pretty with all of these pretty layouts and displays. Thanks for sharing. Your project is very beautiful! I love all the details and love the new set of dies and stamps! Thanks so much for sharing and have a wonderful day! Your project looks great! I'm glad you're showcasing the stamps in other ways rather than just cards! You really show how versatile they can be! Very nice canvas project! TFS! Great frame. Love the details. Great job thinking outside just making cards! Fabulous! Nancy, I really like the canvas idea, I just got my gesso out today, maybe is time I finish using it ;)Love the mini LO is very original. wowzers Nancy this frame is gorgeous girl!! You did a awesome job with Emma's stamps! !